This sword belongs to Saijyo saku ranking. Habaki :gols wrapped double habaki. Blade length : 32.42cm or 12.76 inches. Width at the hamachi : 3.28cm or 1.29 inches. Width at the Kissaki : 2.64cm or 1.03 inches. Kasane : 0.73cm or 0.29 inches. Shape : The bladse is wide and thick with suitable sori and long Kissaki nice gorgeous shape. Jigane : Masame hada well grained with jinie attach and chikei work. Hamon : Nie deki gunome midare and oogunome mixed with thick nioikuchi. In hamon, active sunagashi, kinsuji scatter. Special Feature : Naotane, born as his secular name ‘Shoji Minobei’ in 1778 or 1779 at Dewa province in Yamagata, considering from his title Taikei used at a later date, his birthday is possibly July 15th. He went to Edo and became a student of Suishinshi Masahide. The Akimoto family in Yamagata province retained Naotane around 1812. Naotane got the title Chikuzen-Daijo in 1821 and ranked up to the Mino (No) Kami in 1848. As building up a solid reputation, he got many invitations to forge swords in various places. He added the name of place to inscribe the signature. Naotane passed away at 1857, aged 79. Naotane could make a variety of styles : Bizen-den, Soshu-den, Yamashiro-den and Yamato-den. He was specially good at Bizen-den and Soshu-den in particular. 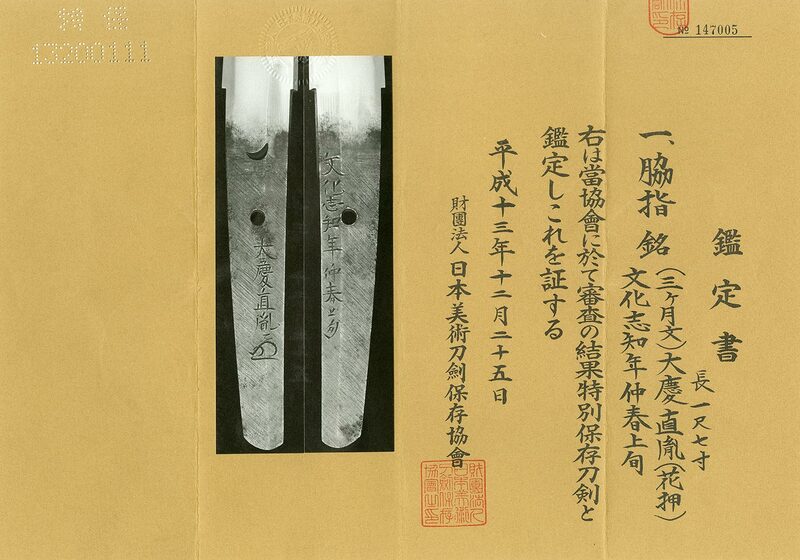 His swords are ranked at the highest rank called Saijo-saku in the last days of the Tokugawa shogunate. Especially his swords forged in the Tempo era (1830 to 1844) are called Tempo-uchi and those are highly appreciated as his best examples attained maturity. From Aoi Art:This sword is very healthy, having no flaws to mention. Especially the hataraki in Hamon is very sctive wild feeling fantastic work which is one of the best Naotane wakizashi. Back ground of age : Mito Kairakuen was built at July 1842. This Japanese garden is one of 3 famous park in Japan. Tokugawa Nariaki 9th generation Daimyo built this garden. This garden is very big and famous for plum forest.